Several women of accomplishment were honored at the Black Women's Roundtable 4th Annual Women of Power "Healthy. Wealthy, Wise" National Summit "SiStar " Awards ceremony, the culmination of the the three-day summit held during Women's History Month. A diverse group of women of faith and good conscience will join Congressional women leaders for a Prayer Gathering & Hill Visits calling for an immediate full Senate Floor vote for Loretta Lynch to be confirmed for Attorney General of the United States. 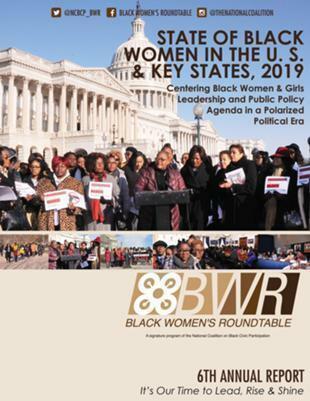 Black Women’s Roundtable Public Policy Network (BWR), the women’s initiative of the National Coalition on Black Civic Participation (NCBCP), released a report reviewing the overall status of Black women during the third annual BWR Women of Power Summit that took place March 26-28 in Washington, DC. The report was released on Capitol Hill the first day of the summit – Public Education Policy Day. 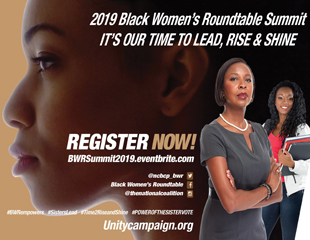 (Washington, DC) - Hundreds of women from around the country will convene in the Washington, DC area Thursday, March 26, 2015 - Saturday, March 28th, 2015 for the Black Women's Roundtable Women of Power "Healthy. Wealthy, Wise" National Summit. The three-day summit to celebrate Women's History Month will include a wide range of activities with participants going to meet with lawmakers on Capitol Hill March 26th, and forums, meetings and other activities at the Crystal City Marriott March 27-28. Statement from Melanie Campbell President of the National Coalition on Black Civic Partcipation and convener the Black Women's Roundtable on the decision to send by the Senate Judiciary Committee to send the nomination of Loretta Lynch as U.S. Attorney General to the full Senate. . "We are pleased that through a bipartisan majority the Senate Judiciary Committee voted to support Loretta Lynch's nomination as the nation's next attorney general. It is our hope that the spirit of bipartisan cooperation continue and that the full Senate move to quickly confirm Ms Lynch who has distinguished her legal career as a devoted servant to upholding the Constitution of the United States and the ideals and principals upon which it stands." said Campbell. The new book. Reach: 40 Black Men Speak on Living, Leading and Succeeding was the topic of a discussion led by Melanie Campbell, NCBCP, President and CEO and Convener, Black Women’s Roundtable, at the Center for American Progress (CAP) on Friday, February 20 in DC. Melanie joined Benjamin Jealous, co-editor, REACH, former president, NAACP and CAP Fellow; Trabian Shorters, co-editor, REACH, Founder and CEO, BMe Community; Shaka Senghor, contributor, REACH; national representative BMe, author and anti-gang activist; Charence Page, Chicago Tribune columnist and 1989 Pulitzer Prize winner for Commentary; and Alex Peay, contributor, REACH; founder, Rising Suns. Peay is a coordinator in Philadelphia, PA for The National Coalition's Black Youth Vote (BYV!) which is co-led by Sherman Justice, Black Male Initiatives Fellow, BYV! who attended the event. National Coalition/Black Women's Roundtable Joins "Grand Alliance" Coalition to Save Public Postal Service. Melanie Campbell, president and CEO of the National Coalition on Black Civic Participation (NCBCP) and convener of the Black Women's Roundtable (BWR), today joined members of the American Postal Workers, CWA and other religious and advocacy organizations at DC's National Press Club for the launch of more than 60 organization member coalition to save the public postal service system. Melanie L. Campbell, the president and CEO of the National Coalition on Black Civic Participation (NCBCP) and convener of the Black Women's Roundtable will be among the major speakers at the sixth annual Pennsylvania Progressive Summit in Harrisburg, Pennsylvania. Campbell will join U.S. Senator Bernie Sanders (D-VT) during the event's morning plenary , Saturday February 7, 2015. The summit is the state's largest and most dynamic gathering of progressive activists and leaders. More than 800 persons are expected to attend. (Washington, DC,) January 15, 2015 - The Black Women's Roundtable (BWR) announced today the launch of its 2015 Healthy, Wealthy and Wise Economic Empowerment Project. The BWR Empowerment Project will provide more than 2,000 Black women and girls of diverse ages, economic levels and backgrounds with strategies, tools and resources to invest in their goals to achieve sustainable economic security, prosperity and healthier. lifestyles. The project will utilize diverse entrepreneurship training models, civic engagement, coalition building and leadership development to achieve these objectives. The Black Women's Roundtable is optimistic about the progress the NFL has made in their continued efforts to put tougher personal conduct policies in place and also create programs designed to change the culture of violence in the league and beyond. By including a diverse group of individuals and organizations with expertise in domestic violence and sexual assault, the NFL is headed in the right direction. Black Youth Vote fellow, Sherman Justice, made the following remarks at the recent "Justice for All" march calling for Congress to pass legislation on police brutality in the recent murders of Mike Brown, Eric Garner, Akai Gurley, Tamir Rice, and many others. Melanie L. Campbell remarks at the recent Justice for All march in Washington DC featuring the families of black men slain by the police. The march was co-hosted by National Action Network, National Urban League, and Black Women's Roundtable and called for Congress to pass legislation on police misconduct. Currently reading page 5 of 15.